In March 2007 I was requested by His Excellency Ty Sokun, DG of FA, to accompany FA head vet, Dr Nhim Thy, to Mondulkiri to inspect an injured elephant calf. We were told it had been wandering alone in the forest and came across a WWF patrol elephant. Happy to find company of its own kind, the calf followed the big bull back to Trapeang Chhouk, a WWF patrol station in the area. As requested, Nhim Thy and I left with WRRT members, Prom Nol and Lai Chaidet to check it out. As soon as I saw the little elephant I wished I was somewhere else. He was in a bad way and seemed sure to die. He was badly injured and so very thin. 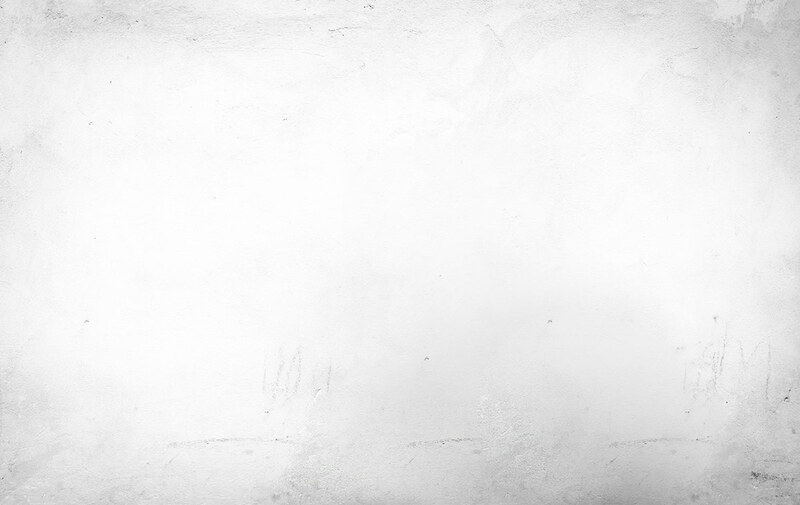 It seemed only his fighting spirit was keeping him upright. 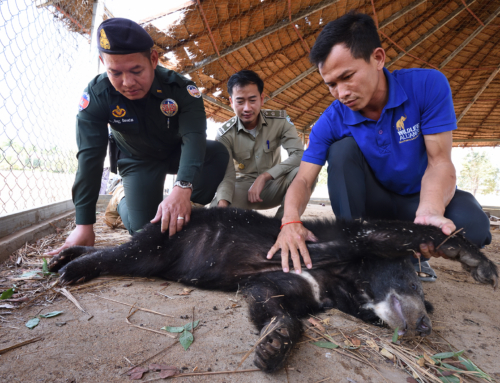 The WWF team had captured Chhouk, meaning Lotus, named after their patrol station and had tethered him around the neck to a tree – a sensible decision to stop him wandering off. They were feeding him whatever forest food the little one would eat. The guys were doing their best, but out in the forest they had neither the facilities, the medicine, nor the expertise to cope with such a serious problem. We sedated Chhouk, treated and bandaged his injured leg, following which Nhim Thy returned to Phnom Penh to report to his boss, leaving me to look after Chhouk. 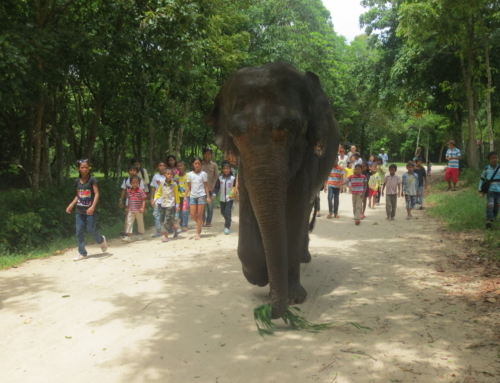 I was sure we would be asked to transport the elephant to Phnom Tamao and the track we would take out of the forest was treacherous. 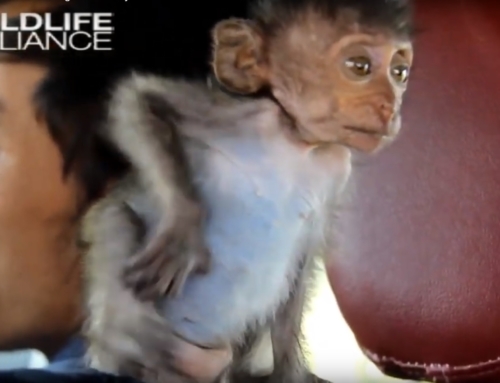 We needed Chhouk to be as calm as possible if he was to survive the journey. I slept in a hammock beside the little elephant, hand feeding him everything he ate. He was very aggressive for such a small chap, but quickly quietened down, allowing me to handle him. The correct decision was made by the authorities and around one week later Nhim Thy returned with other members from the WRRT, who would act as security for the move. We sedated Chhouk, bandaged the injured leg again and lifted him into the cage of branches and banana trees we had built in the back of his transport truck. I was extremely worried for the track was rocky and undulating. If Chhouk fell he could injure himself further. I had words with the truck driver, indicating to him what would befall him if I felt he was not driving with sufficient care. We set off on March 8th, 2007 and in the event my worries were unfounded. The truck driver was excellent and Chhouk lay sleeping off the effects of the sedation during most of the journey out of the forest, which although it was only 16km, took over three hours to complete. We hit the main road and after a brief rest in Sen Monoron to feed and rest Chhouk, we started on the long drive south, through Phnom Penh and on to Phnom Tamao. We took it very slowly, stopping at intervals to give Chhouk a rest. 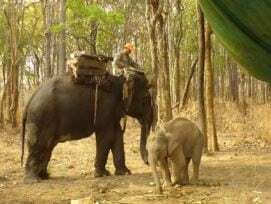 I travelled in the back with the elephant, feeding him throughout the journey. 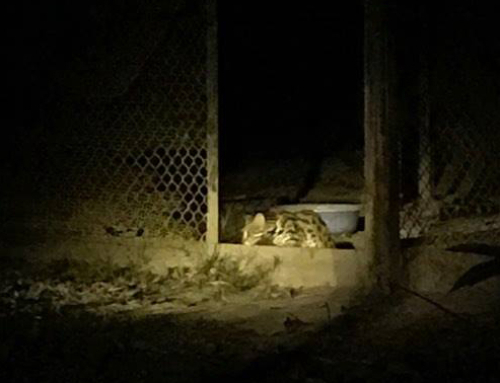 We would sleep once Chhouk was safely installed at PTWRC. 26 hours later, on March 10th, we arrived and lifted the small elephant into one of our stalls in our elephant house. Chhouk had arrived in one piece, but we now had to heal his wounds. He had lost the bottom part of his leg to a snare, the constriction cutting off the blood sufficiently to kill the flesh below. We sedated him each week, his wound was cleaned, small fragments of bone and damaged tissue were removed and the leg was re‐bandaged. 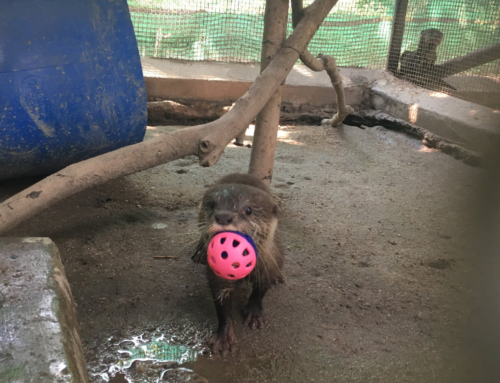 I had asked Mr Tham, one of the general keepers at the Centre, if he would like to join our team and care for the new arrival. At that time Tham might not have been everyone’s choice as the candidate to administer love and care to a sick baby. He is about as wide as he is tall and in the early days I used to refer to him as the “Loutish One”. 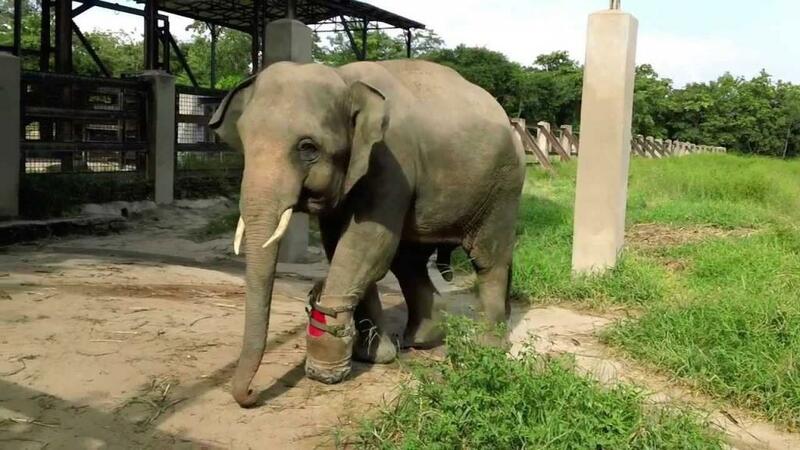 There are stories of his thuggery – to his fellow keepers, never to animals! Tham agreed to join us and immediately proved that I had made the correct decision. He cared for his new charge diligently, sleeping beside Chhouk each night, for like any baby, elephants need love. Tham bought bananas and two chickens as an offering to his Gods and a request they look after Chhouk. His gift seems to have worked…although when I asked Tham later if his Gods had enjoyed their meal he replied that actually they had eaten only a little, but that his friend, head keeper Sitheng, had found the chicken particularly good! The healing powers of wild animals can be amazing and each week when we undressed the leg with Nhim Thy we could almost see the skin re‐growing down the leg and around the under side of the remaining stump until it was completely healed, with the skin finally covering the entire area once again. However the job was only part‐done, as unfortunately we could not “re‐grow” the missing limb. Then fate took a hand. 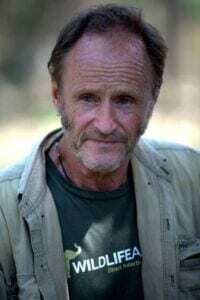 In November, while I was in the United States raising funds for our work, we received information that the Cambodian Forestry Administration had “ceased cooperation with Nick Marx”. There is no need to dwell on the uncomfortable twelve months that followed. Suffice to say that in November, exactly one year later, the FA invited me to return and we have all learned from this experience. Wildlife Alliance continues with the task we have set ourselves, to rescue and care for illegally traded wildlife and relations with FA are currently excellent. When I got back to PTWRC my priority was to do something about Chhouk’s leg, for he was clearly struggling. 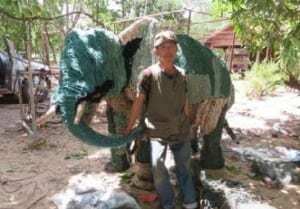 He used to walk in the forest with elephant, Lucky, who had taken on the role of big sister, but he was very sore and tired quickly, needing frequent rests. I contacted several prosthetics organizations, of which there are many in Cambodia. 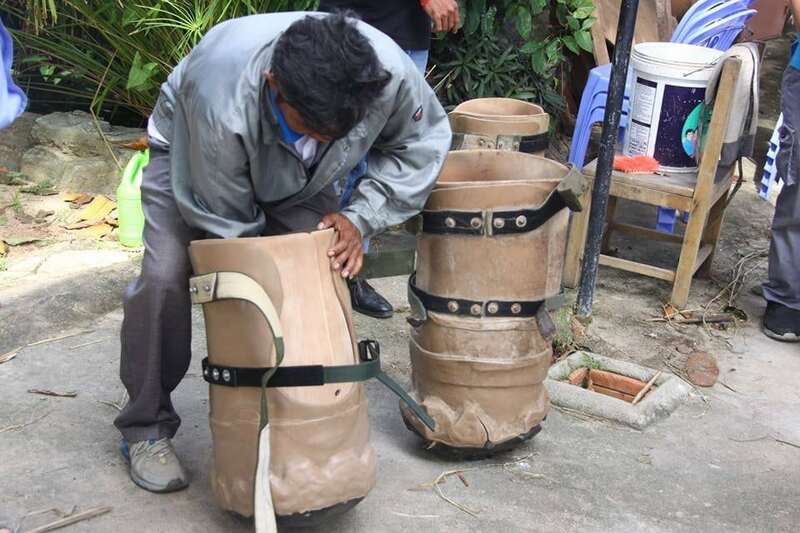 Some volunteered their best wishes, but none offered to help… until I spoke to Cathy McConnell of the Cambodian School of Prosthetics and Orthotics (CSPO), under the auspices of the Cambodia Trust, now Exceed‐Worldwide. Cathy made no promises, but said she would give it a go. 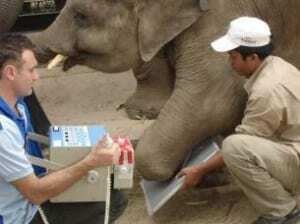 Early in 2009 my friend, vet Paolo Martelli, came over to help and x‐rayed Chhouk’s leg to see if there was anything undesirable inside that we should look out for. 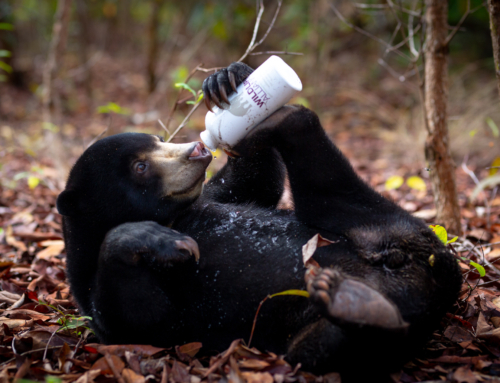 CSPO took the first cast of the leg, while I fed a steady stream of treats to keep Chhouk occupied. The first prosthesis arrived a few weeks later and Chhouk took to it immediately, happily walking into the forest like he had worn it all his life! He no longer got tired and was clearly enjoying life more. Sisary has now taken over from Cathy, but things are mostly the same. The team continues to make Chhouk’s shoes and we are now on number 14! CSPO also conducts the repairs that are needed more frequently nowadays as Chhouk grows and we would have been lost without this great organisation! 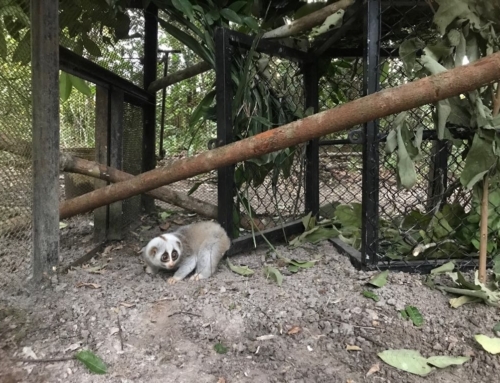 Chhouk is a big lad now and we can only handle him using the protected contact system, from behind the safety of steel – I am responsible for the welfare of my staff as well as our animals! However we must still care for his disability and under the directions of head keeper, Try Sitheng, Chhouk has been trained using reward based, positive reinforcement training, using food to get him to allow us to change his shoe, check his leg twice daily, administer medical treatment, create new shoes and anything else we may need to do. We manage perfectly! Chhouk has become a bit of a celebrity and often we are asked to tell his story in different ways. Contracts have not yet been signed and I cannot give details, but I have been contacted by an author who expressed a desire to write a book on Chhouk’s story. I have given all the help I can in the hope that this might be another opportunity to tell people about the terrible damage indiscriminate use of snares does. Let’s hope for a best seller! Last year, in 2016, I was contacted by The Elephant Valley Project, in Mondulkiri, requesting assistance with another elephant calf that had been snared and was wandering without its mother, badly injured. I left with Buntheoun and vets Chenda and Nhim Thy and we drove through the night, arriving at Keo Seima around midnight to the news that we were too late. The little chap had died of infection caused by constriction from the snare. He was very small and must have suffered greatly. I promised him that I would not let his short life go unmarked. 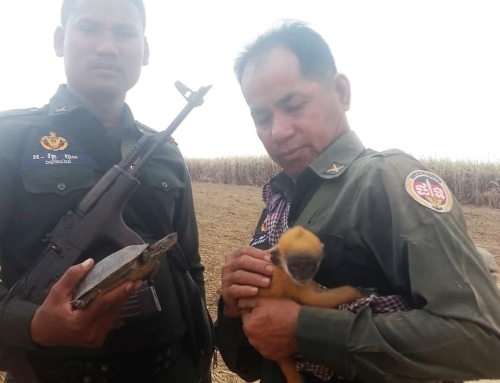 I called all the other big conservation NGOs working in Cambodia together in an attempt to address the problem of snares collectively, which I felt would carry more weight. The “meeting” over lunch on a Friday did not seem to help much. I did not eat and I discussed our next moves with my friend, wildlife photographer, Jeremy Holden and Tom Gray, our Director of Science at Wildlife Alliance, who pushed things further. We decided we should hold exhibitions with graphic photographs illustrating the problem and Tom contacted Cambodian make‐up artist, Apple Love, whose imagination led to models imitating the positions of the snared animals in our photographs. 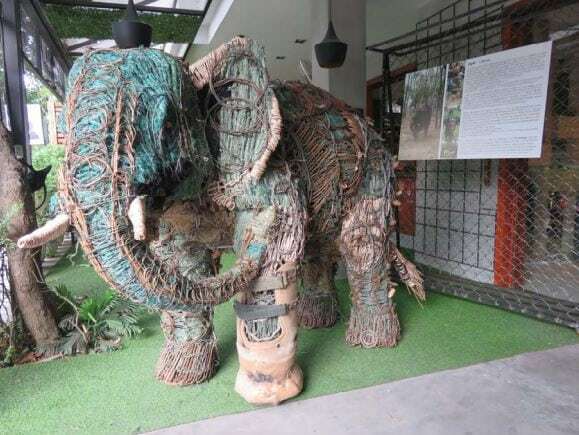 I contacted my friend Sopheap, our mad artist/constructor, asking if he could create a model of Chhouk made entirely of snares. Only a deranged mind could have done such a thing and Sopheap was perfect for the job! At first Bunthoeun and I wondered if we had done the right thing and whether the model would be ready in time for the first “Capture” exhibition at Felix Café in Phnom Penh, but we need not have worried. The model is a replica of our elephant, prosthesis and all. It would be impossible to improve upon! There are changes to the Environmental Laws in Cambodia currently being contemplated by the Cambodian government and our campaign is timely. 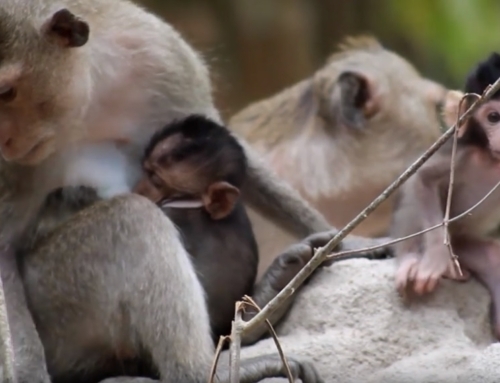 What an excellent report on Chouk from his traumatised beginnings to his life now.The fact that this was not just one intervention but a lifelong commitment to this animals’ welfare is what makes it all the more admirable. In return Chouk has enriched so many lives both elephant and human. What a huge impact one human can have unravelling the trail of destruction by many. Perhaps the Ministry for Environment should have some ‘hands on’ experience of being snared- That may make a more significant statement as an exhibit in the foyer of the MoE! Well Done to all in rescue and rehab of Chouk. Makes me proud to say I knew this tiger keeper!